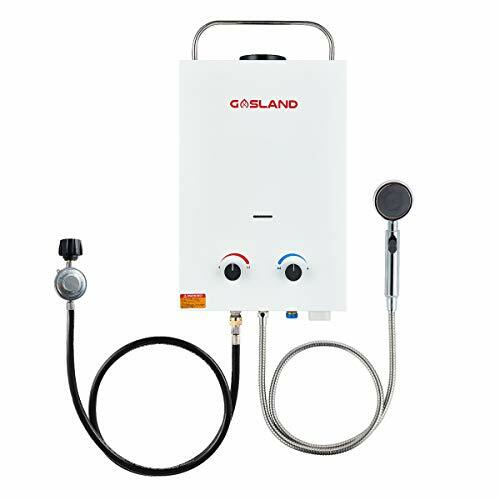 Gasland 1.58GPM 6L outdoor portable tankless water heater has compact size and lightweight design allowing for a convenient carrying. Flame failure device, anti-freezing protection, over heating protection can ensure the family safety. Maximum power output 41,000btu/hour, low water pressure start up, just need 2.5 PSI of water pressure. The best solution for outdoor hot water, perfect for camping, RV life or anywhere you need hot water. More safe: Flame failure device, anti-freezing protection, over heating protection to ensure the family safety. More professional: We developed and manufactured this tankless water heater extremely following North American Norm. 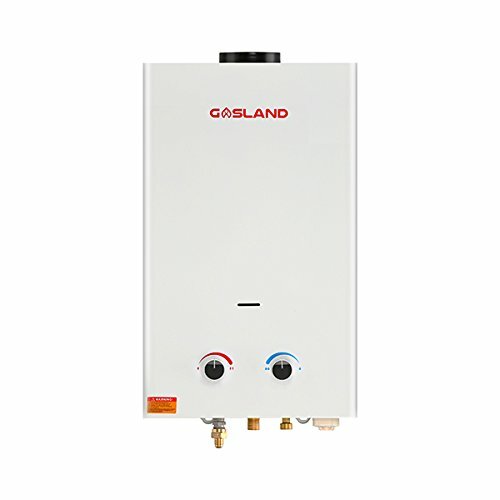 More convenient: We have professional service team in America, help you to solve tankless propane gas water heater problem more efficiently. More economical: Compact and light weight structure with 11.5% energy saving technology. 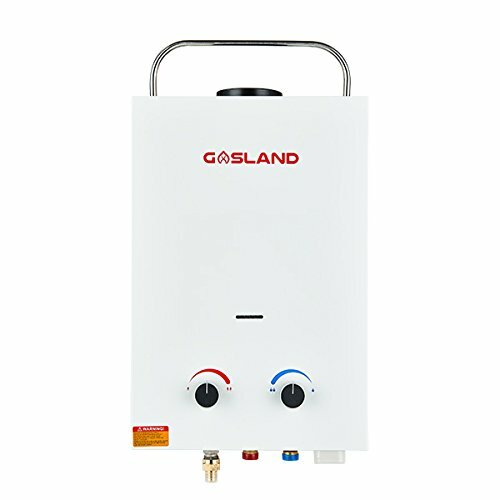 1 x BS158 portable gas hot water system. 1 x 5 feet CSA approval regulator & gas hose. 1 x garden hose: 1/2" BSP Female X 3/4" GHT Male. 1 x garden hose: 1/2" BSP Female x 3/4" GHT Female. 1 x gas inlet connector: 1/2" BSP Female x 5/8" NPT Inverted Flare Male. 1 x ON/OFF shower head and pedestal, includes 5 feet shower hose. 1 x accessories package(fixing kits includes water tape, wood screws, washers). 1, Securely hang your water heater using fixing kits. 2, Insert 2 "D" cell batteries(not included) and be sure the polarity of them are correct. 3, Connect the gas inlet with supplied gas regulator. 4, Connect water inlet with a standard garden hose, and connect water outlet with shower hose and shower head provided. 5, Adjust the water and gas knobs to get ideal temperature as you want. ?MULTIPLE PROTECTION OF FAMILY SAFETY? Flame failure device, anti-freezing protection, over heating protection to ensure the family safety. Automatically decrease water pressure between 2.5-110PSI. The anti-freezing drain plug can discharge the residual water to avoid freezing in cold areas or in case of long time no use. High water temperature proection over 167 °F. Shut off gas supply automatically under unexpectable flameout. ?COMPACT, LIGHTWEIGHT DESIGN ? Compact size and lightweight design for easily carry. It can bring a amazing hot shower for you when you are camping , to the beach, etc. Also you can wash your pets with this tankless water heater in outdoor. Hang it using the mounting bracket on the top/back of the gas water heater. It only takes you a few minutes to install it. Or you can install it according to the instructions. ?ON DEMAND HOT WATER, ENJOY BATH ? Maximum power output 41,000btu/hour, get instant endless hot water easily wherever you are. No need to preheat before using tankless water heater. As soon as you turn on the tap, the water ?ows with your desired temperature. Low water pressure start up, just need 2.5 PSI of water pressure. 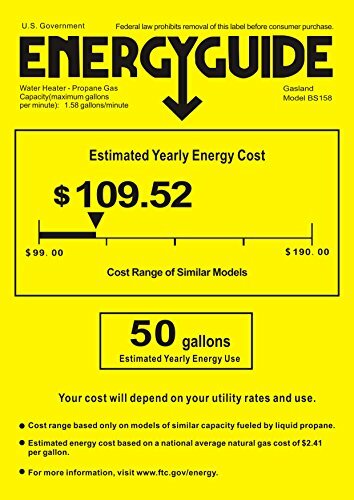 1.58 gallons per minute of on-demand hot water. Fully adjustable heat and water flow. ?SAVING ENERGY&MONEY ? Compact and light weight structure with 11.5% energy saving technology. The propane water heater exchanger and main burner are desinged with advanced combustion technology to decrease gas consumption and burning noise. You will save a lot of money when you use our tankless water heater. ?1 YEAR WARRANTY 100% MONEY BACK ? 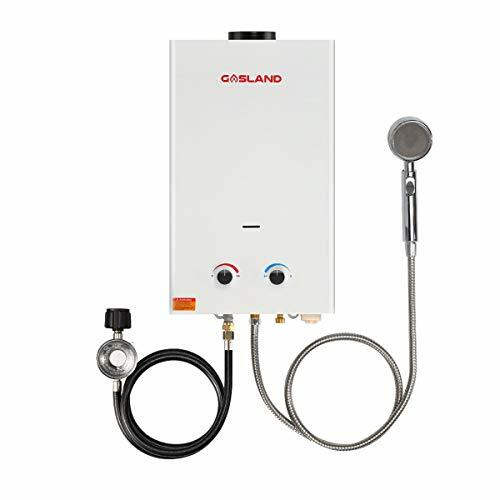 Gasland tankless water heater comes with everything you need, including CSA approved gas regulator and required adapters. We offer you 1 year warranty and please contact customer service team for replacement or after-sales service during the warranty period via hotline or email. The local professional service team will ensure your happy shopping experience on Amazon.